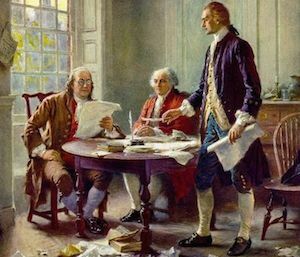 The artistic depiction of the Declaration of Independence being written, with (from left to right): Benjamin Franklin, John Adams and Thomas Jefferson. Public domain image by Jean Leon Gerome Ferris. The United States blows out 240 candles on its next birthday celebration two days from now. Here are some facts and trivia about the nation’s most patriotic holiday. The final wording for the Declaration of Independence was approved on July 4, 1776. Thomas Jefferson was the main author, and the Continental Congress the editors, with the document signed and ratified on our nation’s holiday. The document, though not formally divided, is comprised of several sections including: the Introduction, Preamble, Indictment, Denunciation, Conclusion and Signature section. 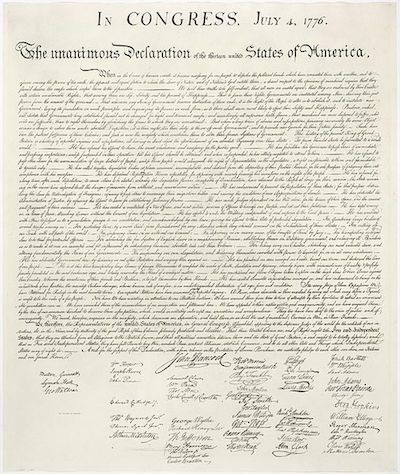 “We hold these truths to be self-evident, that all men are created equal, that they are endowed by their Creator with certain inalienable Rights, that among these are Life, Liberty and the pursuit of Happiness,” is one of the most monumental statements on human rights and is contained within the Declaration of Independence. The document itself is lauded for its overall strength as a document that embraces the human spirit. The United States Declaration of Independence. Public Domain Image. The original copy of the document that was signed by 56 delegates is kept at the National Archives in Washington, DC. Over time, that document has faded because the technology that we have today in preserving papers was not in existence and known then, and in the century following the famous document’s creation. At that time, there were only 13 colonies, which included: Connecticut, Delaware, Georgia, Maryland, Massachusetts, New Hampshire, New Jersey, New York, North Carolina, Pennsylvania, Rhode Island, South Carolina, and Virginia. The document was penned in Philadelphia, where Jefferson wrote the first draft from a portable writing desk that was small enough to nestle on his lap (an old-school laptop, literally) in a boarding house now known as the “Declaration House.” It was adopted in the Assembly Room in the same city in Independence Hall. The document was forwarded to the printer on July 4. It is often argued, however, that most signateurs did not etch their John Hancock’s into it (a definition coined following the most prominent signature on the document) until Aug. 2. However, Hancock and Charles Thompson signed off on it on July 4. Jefferson and also John Adams have an ironic web of facts that intertwine them. It was Jefferson who believed Adams should draft the Declaration, but it was Adams who was the one that convinced the “Committee of Five,” a group that was in charge of the drafting, that Jefferson should be its author. The Committee included: Adams, Jefferson, Roger Sherman, Benjamin Franklin and Robert R. Livingston. Adams and Jefferson consulted together on the document. Adams served as the United States’ second President and was the first Vice President under President George Washington. While Washington was non-partisan, Adams was affiliated with the Federalist Party. Adams served from March 4, 1797 through March 4, 1801. Jefferson was Adams’ Vice President, and took over as President following Adams as the nation’s third President from March 4, 1801 through March 4, 1809, serving two terms under the Democratic-Republic Party, with Aaron Burr and George Clinton his Vice Presidents. When the nation celebrated its Golden Anniversary on July 4, 1826, 50 years to the date that the Declaration was signed off and printed, both Adams and Jefferson each died, with Adams age 90 and Jefferson age 83. Jefferson preceded Adams in death that day, and ironically, Adams’ last words as he died in his Quincy, Mass home of congestive heart failure were reportedly: “Thomas Jefferson survives.” He did not realize his friend had died about six hours prior. The two actually had developed a severe rift due to the differences between their Federalist and Democratic-Republican ideologies, and several political moves each took during their careers that the other did not agree with. There was a decade that the men did not correspond, until Adams sent his greetings to Jefferson on New Year’s Day 1812. Jefferson responded and for 14 years, the two wrote back and forth to one another in a series of 158 letters. 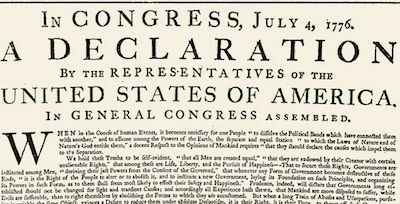 The first celebration of Independence Day took place on July 8, 1776, when the Declaration was officially read in Philadelphia (The Pennsylvania Evening Post ran the document on July 6, and is the newspaper first credited with printing it). As the public heard the words from the document for the first time on July, there was music and bells chimed throughout the city in celebration. First printed copy of the United States Declaration of Independence. Public domain image. The Liberty Bell was not one of those bells, in spite of common lore, as this beloved bell was removed from the city and sequestered in nearby Bethlehem and later Allentown, Pa. under floorboards of a church. This was due to other bells being destroyed and repurposed for munitions. The bell was returned to Philadelphia in 1778 after the British had departed and used in Independence Day celebrations after it was remounted in 1785. The first celebration, as many know it today with fireworks took place a year following the signing of the Declaration in Philadelphia on July 4, 1777. Congress decided on fireworks, adding in bells and bonfires as part of the festivities. Jefferson held the first celebration at the White House in 1801, the year that he took office. Though Independence Day was recognized annually, it was not memorialized as an official holiday until 1870, and a paid holiday until 1938 for the federally employed. Today, Independence Day is still marked with fireworks celebrations, as well as parades throughout many cities, towns and even the smallest of communities within the United States. Many of the municipalities will decorate their towns with flags and red, white and blue patriotic motifs and bunting, as well as residents who often take great pride in dressing up their homes for the holiday. One of the other traditions has become the food celebrations, with a variety of grilled fare the norm, including steaks, burgers, chicken and hot dogs. Summer produce, including freshly sliced watermelon, local tomatoes harvested from plants and corn on the cob newly plucked from the fields and cooked then smothered with butter, are among other favorites. Red, white and blue have become colors synonymous with the celebration, from foods to drinks to decoration to fireworks. The color combination is from the United States Flag, which features red (for “valor” and “hardiness”), white (representative of “innocence” and “purity”) and blue (for “justice,” “vigilance” and “perseverance”). Although the United States’ National Anthem, “The Star-Spangled Banner,” penned by Francis Scott Key, has become synonymous with many events including July 4, Key did not write it until Sept. 14, 1814 when the battle at Fort McHenry in Baltimore ended and he watched as the American Flag fly above the site following the Battle of Baltimore, as he negotiated prisoner release aboard the HMS Tonnant, a British vessel. President James Monroe, who was the nation’s fifth President, serving from March 4, 1817 through March 4, 1825, died on July 4, 1831 at age 73. It was 55 years after the Declaration’s signing when he died in his New York City home from tuberculosis and heart failure. Though he was considered a “Founding Father” of the United States, Monroe was not a signer of the Declaration. Calvin Coolidge, the 30th President, was born on July 4, 1872, 96 years following the Declaration’s signing. Betsy Ross was a Philadelphia flag maker, recognized with making the nation’s first flag and commissioned by General George Washington in 1776 to create the flag with the blue square with the circle of 13 stars. Ross’s grandson was the one who shared her story in 1870, and Betsy Ross first became an American heroine at the nation’s centennial. A bridge has been named in her honor between New Jersey and Philadelphia, and in 1952, 200 years after she was born, a postage stamp was created to mark her birthday. What is now known as the “Betsy Ross House,” is located on Arch Street and where Ross is also interred, long with her third husband, John Claypoole. 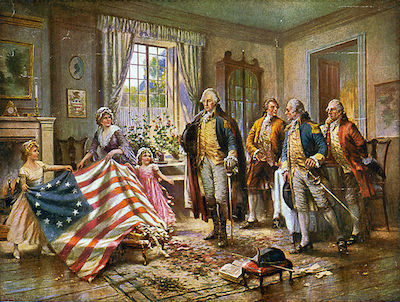 The artistic rendition of Betsy Ross presenting the flag to General George Washington. Public domain image by Edward Percy Morgan. Fireworks, a favorite tradition, were developed in China and believed to keep foreboding spirits at bay. Fireworks became a central part of these celebrations at weddings, funerals and other events. The tradition of launching fireworks eventually migrated to Europe and the United States. Nathan’s Hot Dogs holds its famous annual Hot Dog Eating Contest in Coney Island on July 4. The first of its kind was reportedly between four immigrants who geared up their appetites on July 4, 1916 at Nathan’s Hot Dog stand to challenge one another as to who was the most patriotic. But, in 2010, it was revealed this was promotion lore spun in the 1970s. The contest is marked as celebrating its 100th Anniversary in 1916, when Nathan’s opened its first stand with Nathan and Ida Handwerker peddling hot dogs for a nickel each. But Mortimer Matz, a public relations’ pioneer who pushed the contest’s campaign beginning in the 70s admitted to The New York Times, “We said this was an annual tradition since 1916. In Coney Island pitchman style, we made it up.” The Times admitted in this 2010 article that while their publication and others have often quoted 1916 as the contest’s inaugural date, Nathan’s “had no evidence of the contest” before the early 1970s. Apple Pie has become a July 4th food favorite. Creative commons image by Dan Carsons. 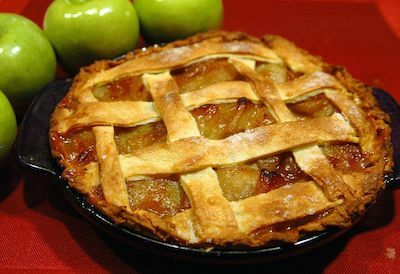 Apple Pie has also become a treat synonymous with July 4., though the recipe often touted as “American as Apple Pie” emerged in from the Dutch during the Middle Ages. In 1999, Vermont declared the dessert the state pie. Baseball has also become a favorite July 4 tradition. Some memorable July 4 baseball moments: Yankees Bill Dickey’s right hook in 1932 to Senators Carl Reynolds after Reynolds knocked him down during the teams’ Independence Day game, Yankee Lou Gehrig’s 1939 brave famous farewell speech that he was the “Luckiest Man on the Face of this Earth,” Red Sox Jim Tabor’s two grand slams also in 1939, Phillies Tim McCarver’s grand slam single in 1976, and the infamous 19-inning Mets and Braves game of 1985 that lasted into the wee hours of July 5. The Philippines was declared independent from the United States on July 4, 1946 with the Treaty of Manila signed between the two nations on that day. Spain handed over the Philippines to the United States following the Spanish-American War in 1898. Today, the Philippines celebrates its Independence Day on June 12. President Barack Obama states he will celebrate this July 4th at the White House as he has done in previous years, and has encouraged citizens this July 4 learn about serving members of the military, veterans, their spouses and families through organizations including JoiningForces.gov. President Obama has lauded the recent dropping of recertification requirements for military spouses, such as those who are nurses and social workers, as they are moved across state lines through base transfers. InsideScene.com wishes fellow Americans across the nation and celebrating overseas, a Happy and Safe July 4th. Stay on the scene with Inside Scene and click here to like our Facebook Page and follow all of our stories on Facebook.